The perks of being a wallflower. Why did anyone not tell me about this book earlier? I actually started reading it last year. After about reading 5 pages I put it away and totally forgot about it. I do regret it. 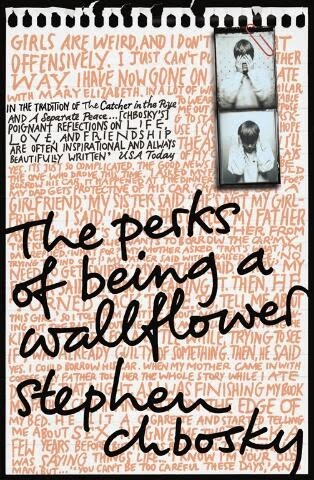 It is a book by Stephen Chbosky and was published on February 1, 1999 which makes it older than me. There is also a movie which I am yet to see. The book is written as a series of letters from a shy, introverted 15 year old boy named Charlie to a stranger who he knew would never be judgemental . The story begins on August 25, 1991. He writes to the stranger about the traumatic things he's experienced such as the death of his favourite aunt and the suicide of his friend Michael. At the beginning of freshman year Charlie befriends Patrick and Sam. They're seniors and later introduce him to their group of friends. Charlie's teacher, Bill, notices his love for reading and writing and constantly gives him extra books to read and essays to write. As the story advances Charlie begins to experiment with cigarettes, alcohol and other drugs. As the end of the school year comes closer to an end Charlie begins to feel anxious about Sam and his other friends leaving. Towards the end of the story Charlie is sent to a mental hospital where some of his traumatic experiences are revealed. Upon returning home Charlie stops writing letters to the stranger so he can participate in life. I know the review was rather vague but it is such an amazing book I want you to read it yourself. "So, this is my life. And I want you to know that I am both happy and sad and I'm still trying to figure out how that could be. "